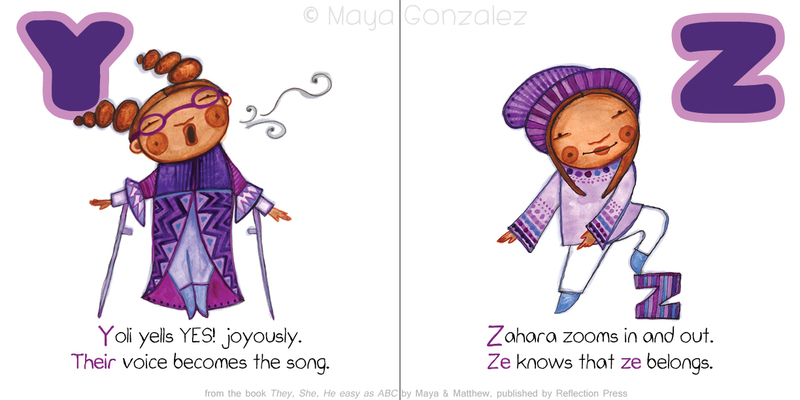 Image description: Interior spread from ‘They, She, He, Easy As ABC’ by Maya & Matthew, published by Reflection Press. Books For Littles (BFL) is free and accessible for readers who can’t afford a paywall. Posts may contain affiliate links, which allow me to earn a commission at no extra cost to you. Check out the full affiliate disclosure along with the BFL statement of accountability. Reflection press is not sponsoring or compensating BFL for this post. In fact, BFL is funded by readers like you via Patreon. Get bonus content and more awesome stuff when you join us! The following text is excerpted from my interview with Maya & Matthew of Reflection Press – Ashia R.
How do we create freedom to just be – and let others be? In our culture, kids are trained to perform gender expectations. They often feel the need to know other people’s assigned gender. Kids police each other’s gender performance. We see this assignment determine how they will treat someone, if they will play together, and how they think they should look and act. We see this on the playground all the time. We invite you to dismantle this idea that we have to know someone’s gender in order to play with them. Kids are here to remind us, not in innocence, but in power. We must not shelter them. Help kids retain their power and wisdom by bringing age-appropriate awareness to the context of our culture. Awareness supports them to see through the oppressive structures they must navigate. Knowing about bullies and bullying systems supports indigenous kids, kids of color, and queer/trans/intersex kids especially, from internalizing damaging messages. Whether they’re experiencing it on the swings or on the nightly news, we use the framework of bullying to talk about power dynamics. This is a necessity for marginalized communities. If this isn’t a necessity for you and your family, you have a choice that others don’t. This gives you, as a parent, all the more reason to prioritize awareness of the larger power dynamics and systems – so as not to damage your child with unconscious participation. Have you walked around your own gender and how it plays in the world? What privilege do you hold? How is yours different from your child’s experience? For folks outside of the LGBTQI2S+ community, especially parents with trans/nonbinary kids, the challenge is also to see what’s been internalized and how that’s impacting what you pass on. Your nonverbal messages will always be the strongest communication with your children. Are you participating in gender assumptions and expectations? Are you passing them on unconsciously? Do you unconsciously prioritize being cis or straight? Do you know queer/trans/intersex people? The conversations you have with your kids will be more meaningful if you start actively looking at your own assumptions first. At times, cis/white/straight parents aren’t aware of how much privilege they carry. Parents unconsciously try to preserve their child’s privilege instead of dismantling the systems that oppress them. The most supportive thing you can do is to start with yourself. Examine the ways you may be participating in and upholding oppressive systems. Your level of discomfort is often a good indicator. Different layers of privilege afford us different layers of comfort. If you’re not feeling discomfort you’re not doing the full work. When you’re claiming your power instead of upholding the status quo, the stress is real. Your heart and body are on the line. This is the heart and bones of it. This is real bodies living life. It takes focus and flow to counter the dominant narratives about IPOC and queer/trans/intersex people and stay steady. Self-love is key. It’s a dance of freedom in an unfree world. Not internalizing the damaging messages all around us. Staying emotionally clear enough to provide self-loving, empowering narratives for our kids. This is the real work. We’re inviting parents to do the same. The stronger we are in ourselves, the more we pass that on to our kids. Use these books as seeds – something small and potent that can take root and grow deep within. Not only have we always been here, we are worth attention. Inclusive imagery attends to – and helps mediate – the larger historical and contemporary erasure that IPOC and queer/trans/intersex communities experience. We create books that don’t just include, but center and expand the lives of queer/trans/intersex kids of color. This systemically shifts the power and focus away from the dominant culture and shows our communities that not only have we always been here, we are worth attention. Reflection in children’s media engages kids and conveys that they belong. This is the heart of our books and a big reason why our press is called Reflection Press. The ‘They She He Me’ series shows that queer/trans/intersex people come from all communities. We are the unifying factor. Both of us queer, Maya as Chicanx femme and Matthew as trans and raised by gay dads, we’ve each had experiences that speak to many of the core challenges faced by the lgbtqi2s+ community and hold perspectives and values that rise from its rich culture. If non-first voice (or non-#OwnVoices) authors are holding strong Western and Eurocentric frames, built on the suppression of queer/trans/intersex people and IPOC, their books may retain cissexism that is built into our culture’s language and perspectives. While bringing more awareness and support to our queer/trans/intersex kids, we’re concerned about the implicit bias we’ve seen in books written by cis, straight authors. These stories place the onus on the kid and not the system. This perpetuates unconscious bias and promotes a cissexist subtext, no matter what’s being explicitly said – conveying a strong message precisely because it is not conscious. Additionally, characters must often be exceptional to be accepted, there’s emotional strife and bullying, and there’s been an almost exclusive focus on children assigned male in dresses. When books are sourced within their community they are all the more powerful, because the stories are authentic and relevant. They rise from need and break silence and invisibility for the marginalized. All this fabulous reflection keeps our family and community present in our kids’ media and shows them that there are many ways to be. Advocate for marginalized communities and put your heart and bodies on the line – but also know when to step back and let those communities speak for themselves. Language is power. Voice is a revolution. We know what it’s like to have language used against us and those we love, as well as our ancestors. We are both acutely aware of how we use language. Like many folks, we believe that we must try to be impeccable with our word if we want to establish respect and inclusion. Language is a big part of how culture spreads. The alphabet is literally the key to reading and writing the language. As homeschooling parents, it was important for us to associate gender inclusion with something as fundamental as the alphabet. This can help counter how language is still used by the dominant culture to erase queer, trans, intersex people. Juggling homeschooling a 5 year old and running our own publishing house makes for a lot of late nights and early mornings. Talking about language and how to use it respectfully, telling stories about the larger truths that have been suppressed – this takes up A LOT of our time. Books like this give us a moment to relax. We can just read together, without constantly having to change the language to be inclusive, or acknowledge who is absent, or stereotyped. For those of us who change all the pronouns and half the story lines in our kid’s books as a matter of course, this is a parent’s delight. The book does all the work. When we become conscious of the real power within language, we can see how it’s been used, as well as how to transform it to heal ourselves. And of course, this brings us back full circle to the alphabet! And why it’s so fabulously revolutionary to say that gender inclusion can be as easy as ABC! Does your community offer racially, ethnically, and gender-inclusive books? If not, donate a book to your local library. Many don’t often have a budget to get stories by #OwnVoices makers and small publishers on the shelves. Use gender neutral words like kids or people instead of ‘boys and girls’ and ‘ladies and gentlemen.’ Learn about suppressed history and indigenous cultures. Speak Truth. Interrupt Falsehoods. Maya & Matthew have created reading guides for their books, plus a free online course exploring the intersection of nature, culture, Indigenous history, and gender at reflectionpress.com and genderwheel.com. You can also keep in touch with Reflection Press on Facebook and follow Maya on Instagram at @mzmayagonzalez. Join us and ignite a generation of kind & brilliant luminaries. Help me highlight more kyriarchy-smashing authors who challenge the dominant narrative with ridiculously cute characters. Plus, get awesome stuff I’ve got waiting for you on Patreon.